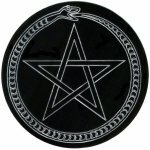 Over the last four hundred years, science and the occult have enjoyed a strange, complex relationship. Partisans for both sides would have us believe that relationship ended in a bitter, drawn-out divorce, sometime in the nineteenth century. This is an illusion. As is so often the case, the reality is much more complex than that. To understand why, we must begin at the beginning of modern science, with Issac Newton, despite the fact that this beginning is entirely arbitrary. Human beings have consulted occult forces in the course of their daily lives for the whole of recorded history. Over the millennia, certain thinkers have rebelled against this trend, claiming that human beings were quite capable of understanding the world just by observing it. One such thinker was Newton. Born the year Galileo died, in 1643, Newton grew up to dream of reuniting religion and what we now call science. He hoped to reconcile the animosity each system of thought had developed for the other over the previous four hundred years. He offered up his “laws” of motion as quantifiable proof, not only of a mechanical, explicable universe, but a universe ruled by an immanent God. "Gravity explains the motions of the planets," Newton said, "but it cannot explain who set the planets in motion. God governs all things and knows all that is or can be done." In writing his Principia, he said, "I had an eye upon such Principles as might work with considering men for the belief of a Deity"
Note the choice of words: this was not the god of some church, be it Catholic, Anglican, or Orthodox. This was not the God of Abraham and Issac and Jacob, but an imminently reasonable God, who created a rational universe out of rational bits and pieces that any rational man can pick up, look at, and understand. Newton implied that, thanks to our God-given five senses and that all-important, divine gift, reason—separating us from animals—man can know the mind of God. (Women, who obviously lacked reason, would have to wait another few hundred years for that.) The mind of God is, in fact, right there, in that falling apple, and in the undeniable fact that there are rational, mathematical rules governing the way apples fall. All you have to do is invent the mathematics to prove it. For Newton, the objective of science was not, as Descartes said, to control the world, so much as to describe it. Newton sat in wonder at the ingenuity of a God who could create a being smart enough to sit in wonder of His ingenuity. Writing more on the Bible than what we would call science and what he called “natural philosophy,” Newton studied Scripture for secret codes and hidden messages all his life. This concerned him more than esoteric questions like true the nature of gravity. It could be, he said, that gravity is an expression of God's eternal love, pervading the universe with the perfect will of the Divine, which obviously seeks itself out. At its core, Newton's physics was an esoteric Christian's retelling of Aristotle's: the apple wants to fall, not because it has an independent nature, but because the independent nature of an imminent God willed it to fall. And fall just so, invariably. Divine intervention was central to Newton's universe. The image of “God the watchmaker” is not his. 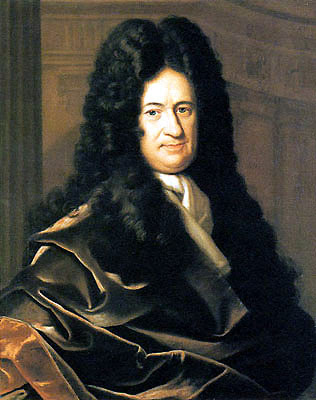 It comes from a joke made by one of his detractors, a fellow called Gottfried Leibniz, who, in a letter to a friend, remarked, “God Almighty wants to wind up his watch from time to time: otherwise it would cease to move. He had not, it seems, sufficient foresight to make it a perpetual motion." Leibnitz was a German philosopher and mathematician, one of Newton's contemporaries. We use his integral sign every day, if we use calculus, along with his differential notation. He said he came up with calculus in 1674, and published an example in 1684, beating Newton's Principia to press by three years. There's a little bit of calculus in the Principia, but it's not the point of the book, and Newton didn't publish a notation system until 1696, despite claiming he came up with the idea in 1666. Now we have artifacts to prove that...but for some strange reason they didn't come to light until after Newton's death. The feud between Newton and Leibnitz, carried out almost entirely through a series of letters written by their friends, has become one of the great controversies of early-modern science. Today, that feud's role in how Newtonian science would come to be understood by politicians, scientists, and the general public is barely discussed. The God of Newton's understanding still cared about the world enough to permeate it with His essential love. Thanks to Leibnitz's joke, all that changed. Newton's disciples looked at Liebnitz's theological diss (a comment on the level with, “Your God is stupid he can't even come up with a self-winding watch.”) and thought, You know...that's a good point. After all, if God is so obviously powerful and perfect (he created man, and gave us our five senses and our reason) then why couldn't God create a perfect universe—a universe in perpetual motion? A clock that needs no craftsman. We puny humans started making things like that in the 1500s, when Galileo caught sight of a swinging candelabra and got the idea of using weighted pendulums. To the English Enlightenment philosophers, it seemed absurd that God could not have beaten Galileo to that idea by eons. 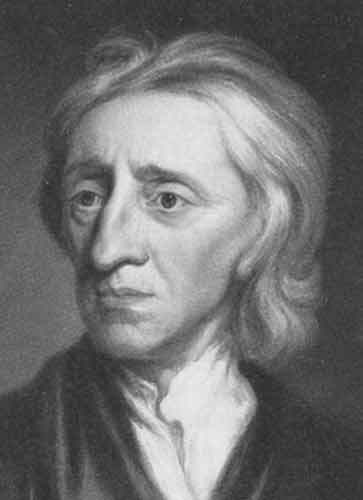 John Locke's God, the consummate watchmaker, was thereafter re-imagined as the ultimate rational designer. No longer immanent, Locke's God became transcendent, the system He created just so damn perfect He can walk away from it with no problem at all. Almost as if it were an experiment. Or a mathematical formula so brilliant it eventually solves itself. Because for all his religious beliefs, Newton's laws were ultimately mathematical equations. You could plug them in and let them do all the hard work for you. Maybe not all of it—there was some problem with the orbits of the planets not quite agreeing with Newton's calculations, and all these stupid peasants kept insisting they'd seen rocks fall out of the sky or some such nonsense. But thank God for those irregularities. Without them, what Newton's contemporaries called “natural philosophy” and what we now call “science” would've died in infancy for lack of work. The way it stood after Newton's death, natural philosophers could hold up new breakthroughs in their calculations as further proof that the universe was harmonious, lawful, and (most importantly) self-contained. When you have a rational universe created by a rational god and operating on rational principals, there's no need for divine intervention. No need for a Heaven or Hell either, since both are unobservable. Falling outside the spectrum of our five senses and reason, theological questions thus fell outside the realm of natural philosophy. Newton's most radical disciples (particularly in France) even began to toy with the idea that nothing existed outside the physical universe at all. There was quite enough stuff inside of it to deal with, thank you. And nothing within the universe could exist save through the agency of Newton's laws. Even if something outside the universe did exist, it would have no effect on the physical world, since there is nothing in the world that operates contrary to Newton's laws. John Locke applied these ideas to politics. Without an imminent God, the Divine Right of Kings is meaningless. Men are born free, and it's up to each and every man (again, women would have to wait a few hundred years) to form a society, and run it as best they could. More importantly, it's up to each and every man-jack of us to consent to such a society, since rulers derive the only real power they have, not from God, but from the consent of those they rule. The Revolutions—from the Glorious one in 1688 to the Latin American ones of the early 19th century—were, in one sense or another, practical applications of these ideas, each experiencing various degrees of success. If one could apply Newton's idea to human society, why not go further and apply them to human beings as well? In 1766, a German doctoral candidate at the University of Vienna did just that. 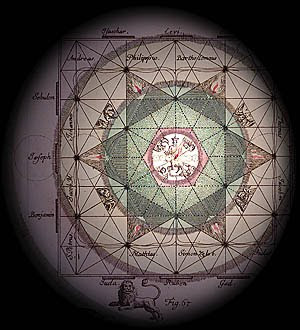 He called his dissertation De planetarum influxu in corpus humanum (The influence of the planets on the human body), and in it he figured, since every body in nature submitted itself to Newton's laws, then the human body must do so as well. It must be some sort of machine, influenced by the gravitational forces of the planets. Since any doctoral student at the time knew the human body as a collection of various fluids, and Newton showed how the moon influences the fluids of the earth, maybe the moon, sun, and the other stars influenced the tides of the human body, causing all kinds of apparently a-causal diseases. Diseases that might be treatable if only we knew which planets influenced what tides. A little math, our doctoral candidate suggested, might save a lot of lives, or at least make a lot of deaths less painful. And isn't that what doctors should be doing? “First, do no harm,” after all. 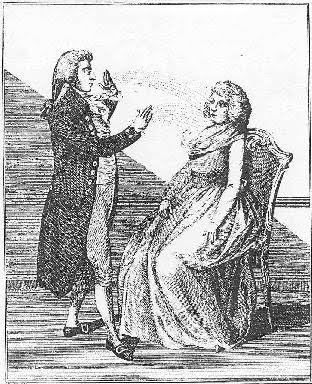 Since this was cutting-edge stuff in mid-eighteenth century Vienna, our candidate got his doctorate and became Franz Anton Mesmer, M.D. Though he never comes out and says it, he may have borrowed his idea from one of Newton's friends, a Doctor Richard Mead, who wrote De Imperio Solis ac Lunae in Corpora humana, & Morbis inde oriundis (On the Influence of the Sun and Moon upon Human Bodies and the Diseases Arising Therefrom) way back in 1704. Closer to Mesmer's own time we find the sensationalist 1748 book L'homme Machine, by the French physician Julien Offray de La Mettrie. L'homme Machine was a reaction to Cartesian mind-body dualism, and La Mettrie the first thinker (that we know of) to explicitly invoke the image of man-as-a-machine, denying the very existence of the soul. He said a rough battle with fever gave him the idea. When he regained consciousness, La Mettrie reckoned that the conscious experience was nothing more than the product of a chemical balance (or imbalance) in his brain. No soul required. It really was as simple as that. Popular outrage (by which I mean, outrage among the conservative, Catholic upper crust of eighteenth century France) at this materialist philosophy (even Enlightenment figures like Voltaire and Baron D'Holbach covered their mouths with lacy handkerchiefs in shock: “Man-as-machine, indeed! 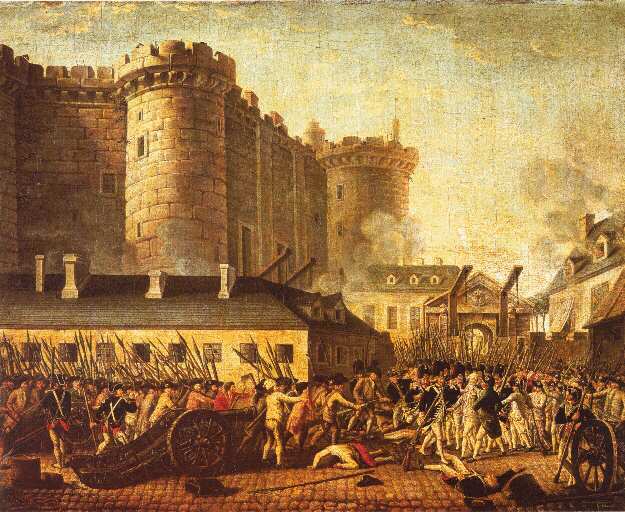 Hurrumph!”) forced La Mettrie to flee the country, because that's just how France worked in those days. He became court reader for King Fredrick the Great of Prussia and (not coincidentally) had his work translated into German for any curious Viennese medical students to pick up and read. For three years he tried it out in Vienna. He'd sit across from a patient, their knees touching, gaze deeply into their eyes, and make passes over them with his hands. It was so weird someone had to invent a new verb to describe it. The man “mesmerized” you, and when he did, you experienced peculiar sensations. Or you went into convulsions. Either way, it was fine. Mesmer figured that blockages of the body's tides caused disease. Clearing the blockage with a little animal magnetism, rather than waiting around for the natural motions of the planets to do so, produced a sudden “crisis”. This was a sign of the healing process kicking into action, soon to be followed by a resolution, and the succession of all complaints. Then, in 1777, Mesmer failed to cure a cute little blind girl—a musician named Maria Theresa von Paradis. Maria just so happened to be the daughter of the Hapsburg Empire's Imperial Secretary of Commerce. Branded a failure by some very powerful people, Mesmer figured it was as good a time as any to move to France. He set up shop in Paris, practicing on the sly, since neither the Royal Academy of Sciences, nor the Society of Medicine, would answer his letters. Still, by the end of three years he was so popular he started treating people en masse, “magnetizing” whole bathtubs of fully-clothed ladies, who climbed in and allowed Dr. Mesmer to pass his hands over them. Even better: have patients pass their hands over each other, since animal magnetism was an innate property of the human body. The thighs were, apparently, a particularly sensitive area. Four years of teaching proteges and establishing clinics in France's major cities was more than enough to draw the attention of King Louis XVI, who offered Mesmer a pension for life if only he'd promise to remain in France and allow a royal commission to verify his claims. Mesmer refused, and King Louis finally directed the Royal Academy of Medicine to look into this impudent Austrian, who'd become the talk of all the salons. Nobles and ministers were getting “mesmerized” left and right, and God only knew what they were doing to each other with their animal magnetism. His Most Catholic Majesty wanted to find out. The Academy appointed a blue ribbon panel to do just that, made up of leading thinkers of the time. These included the newly-arrived American ambassador Benjamin Franklin, the chemist Antoine Lavoisier, and Joseph-Ignace Guillotin, who's name you should recognize. They ruled Mesmer a fraud, which meant King Louis did as well, forcing Mesmer back to Austria in 1780. Private benefactors raised three hundred and fifty thousand louis to finance Mesmer's return, and return he did, in triumph, the next year. 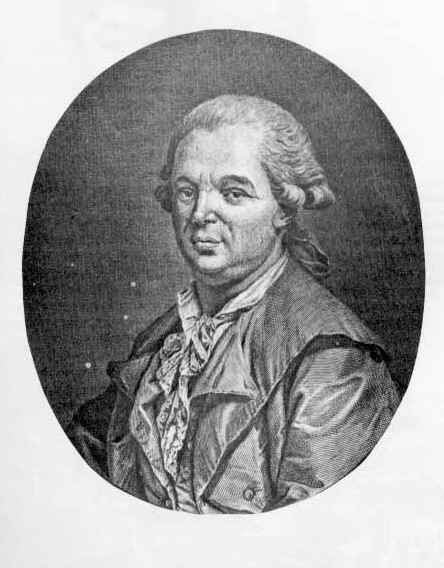 Mesmer remained in Paris until 1784. Having ben banished from Austria, he settled in the German university town now called Konstanz, to die comfortable and famous in 1815. So famous he even turned down an invitation from the King of Prussia to build a school in Berlin. But his ideas lived on. The King 0f Prussia even sent a doctoral student to learn Mesmer's trade, and Mesmer never seemed to turn down a chance to teach his techniques to others. He encouraged his students to spread the knowledge he'd gained, ensuring European doctors and aristocrats would carry right on mesmerizing patients and volunteers well into the nineteenth century. Chief among these was Armand-Marie-Jacques de Chastenet, the Marquis de Puységur. One day, Puységur tried to magnetize a young peasant named Victor Race by stroking Race's head. Race fell asleep and remained insensate when shaken. Puységur commanded him to stand and was surprised as anyone when Race obeyed, still apparently locked in his trance-like state. It seemed Race would obey any command Puységur shouted to him and have no memory of the experience upon waking from his trance. Puységur called this "spasmotic sleep" or "artificial sleepwalking." Today we know it as "hypnotic induction," though it would take twenty years for anyone to invent the term "hypnosis." In the meantime, John Locke's England prospered. The Anglican God still held high place and philosophers were fine to have Him. After all, He gave us these gifts of reason and our senses, the better to study His revealed Word and the Nature that made it manifest. He also granted England, through His infinite grace, a monarchy and a church leadership all-too happy to use the new science—a science of Newton and Locke and Sir Francis Bacon and James Watt—to their advantage. A science that would go on to transform Britain from an island of rustic seafarers into a worldwide, industrial Empire, the world's first. A science anyone, if they properly trained their five senses and their reason, could participate in, because Newton and Bacon and Locke had specifically designed it that way. In this spirit of free and open scientific inquiry, middle-class dilettantes began toying around with any thing they could get their hands on. 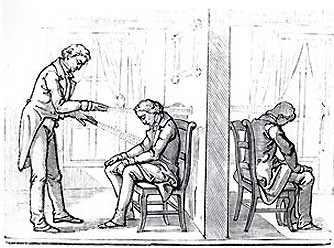 A few, beginning in the 1780s, grabbed on the hot new thing from France called "mesmerism." Sure, the French Royal Academy said Mesmer was fraud, but what did those effete coffee-drinkers know about Science? Hard-headed Englishmen (and -women) were expected to justify their beliefs through experience, and what better kind of a experience than a scientific one? After all, wasn't that what God expected of us, as proper English citizens? Besides, it's not like the Church or the state had any interested in policing scientific inquiry. In France, on the other hand, thinking too much could catch you quite a bit of flack from both church and state. Ask La Mettrie. Ask Mesmer. In France, these institutions were so powerful, and so intimately aligned, that they had no need to establish and support a new, separate, scientifically-minded class of intellectuals. Sure, you could invite them to the salons, wind them up with a little Spanish wine and let them blather on about education, or social justice, or natural man, or some other damn thing. All in good fun. But if they got too loud, or too embarrassing, with their calls for natural rights, it was better to throw them into prison, or exile, before things became dangerous. How much these ideas—the mathematical universe run by the watchmaker God—filtered down through the natural philosophers and the leaders of revolutions to the level of ordinary citizens will never be known. The religious character of the eighteenth century is far more blatant. The old conflicts between reason and faith continued through wars and revolutions that revealed the darker character of the Enlightenment to a very startled world. Like energy and matter, these conflicts are conserved in history, only changing their form as time goes on. One Frenchman, Denis Diderot, even discarded the idea of a providential God altogether in his 1749 essay Lettre sur les aveugles ("Letter on the Blind"). Published anonymously, it was immediately censored by the authorities, its author arrested and tossed into the dungeon at Vincennes. After three months in prison, Diderot signed an agreement never to publish anything critical of religion ever again. Instead, he spent the next twenty years attempting to collect all human knowledge in his Encyclopedie, causing great controversy - particularly with its evenhanded views on Protestantism, natural rights, and Catholicism. Officially banned by royal decree, it never made its editor rich, or even comfortable. Forced to sell his personal library to pay for his daughter's wedding, Diderot's only real friend in the upper crust seems to have been Catherine the Great, of Russia. When she heard of the reknowned intellectual's fire sale, she bought up the entire library and offered Diderot a yearly salary to keep it safe for her in Paris until such time as she felt the need to read. Diderot used the money to pay for his daughter's dowry. Thanks to these, and similar life-stories, the French Enlightenment divorced itself from both King and Church. Neither offered it any safe haven, so it threw in (or was dragged in, depending upon whom you ask) with the radicals and revolutionary agitators. England managed to ship most of those over to its colonies—to its eventual chagrin. France implemented exactly the opposite policy, to its eventual downfall. Thus, revolution, and the problem of revolutionaries since time immemorial: now what to do? 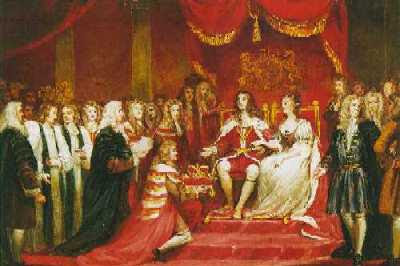 If you believe, as John Locke and Voltaire did, that human beings are rational creatures governed by the rational laws of a rational universe—laws that ensure human beings will do everything they can to preserve themselves by maximizing pleasure and avoiding pain—then you erect a rational society without those prideful, backward-looking institutions like the Church or the Monarchy, which only retarded human beings “natural" morality anyway. You reform the calender to do away with all the religious trappings stamped into it. You reform education based on Rousseau's Emile. And you suggest the idea for the guillotine in order to kill all those agents of the old society as humanely as possible. 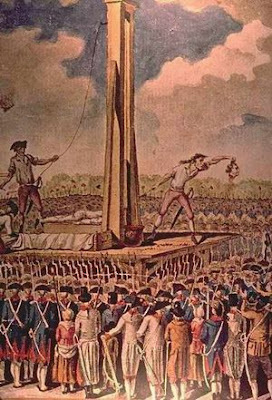 After all, the guillotine was a rational alternative to hanging, or burning, or a man with an ax who's arm often tired after a hard day's work, ensuring he'd need three or four whacks to do a proper job. It also became the symbol of a bloodthirsty, self-destructive regime that eventually transcended everyone's worst expectations and set the pattern for revolutions until well into the twentieth century. 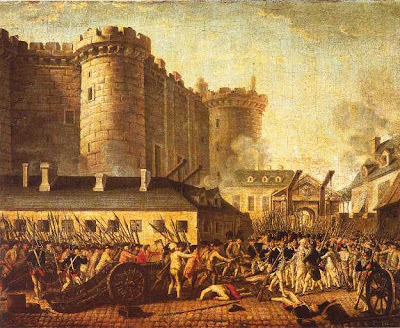 The French Revolution and the Napoleonic Wars it triggered convinced Europe's conservative elites that the Enlightenment Project (as it was not yet known) was a morally-bankrupt one, just as they'd always said. It led inexorably to worse tyrannies than any monarch ever imagined. With no God to appeal to, the rational State, and the society it created, assumed His place in the minds, hearts, and mouths of the Revolutionary leaders. Leaders who were, as far as those who lived through their reign were concerned, nothing more than a collection of hypocritical power-seekers who appealed to the State the same way clergymen appealed to God. Because if you know the absolute, mechanical Truth of how the universe works, you can justify all sorts of atrocities. Theocratic dictators from Augustus Cesar to Stalin to Hitler knew this in their bones. So does every leader worth his or her salt today. As one of George Orwell's characters said, over a century after the last head rolled through the streets of Paris, “He who controls the past controls the future; he who controls the present controls the past.” For a time, the Enlightenment controlled France's present, and it would go on to gain control over the entire world, long after Napoleon destroyed the institutions it created.